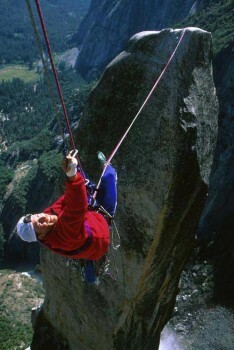 Although it is only two pitches long, this route rewards you with one of the most spectacular settings in Yosemite. The climbing is technically easy and the gear is mostly fixed, but the long approach, big exposure and complex logistics make this route quite an undertaking. It is not recommended for a first aid climb. Which SuperTopo guidebooks include a topo for Lost Arrow Spire Tip? One of the most spectacular summits in Yosemite.